Belum caves in Kurnool District of Andhra Pradesh are millions of year old. An exploratory expedition unearthed clay vessels from these caves, said to be dating back to 4500 BC. The modern day existence of the caves was explored surveyed and recorded sometime around 1884 by an European H.B. 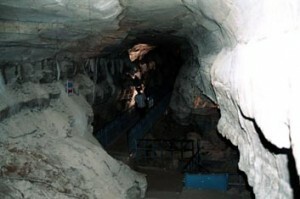 AP Tourism Development Corporation took charge of the caves in 1999 for beautification and maintenance. After clearing up the slush inside, creating pathways, illuminating the caves at strategic locations and providing frees airshafts, the Caves have now been opened to the public. The well-planned illumination rids; the caves of eeriness and creates instead; a bright splendour to give that breath-taking view all through the structure. The present area that is accessible to the public is around 2 kms. Extending upto 3225 mts. in length, 10 metres deep at the entrance and 29 metres at the deepest point inside, the Belum Caves are the largest cave system in the country in the plains. This is also the longest cave system among all the caves of South India. The main passage of the Caves is a horizontal one, after a descent of up to 20 metres. There are three well like cavities with the central one being the main entrance to the caves. Steps have now been provided for getting into the caves comfortably. As one walks through the caves, it is a breath-taking experience. On the ceiling and on the floor are the fantastic artworks of nature created by stalactite and stalagmite formations. There are a number of spacious chambers, passages, fresh water galleries and siphons. The soft light illumination adds to the beauty of the formations. The local villagers familiar with the caves have name some of the landmarks inside as ‘Simhadwaram’, ‘Kotillingalu’, ‘Mandapam’, and ‘Pathalaganaga’. Belum Caves are located in Kurnool district. There are bus connections from nearby towns. This entry was posted in Andhra Pradesh, Belum Caves. Bookmark the permalink.